How does a summer YokmoK? How does a summer YokmoK? Have you ever wondered what you have is the experience enjoyed by our adventurous? Like last week developed a Top 10 adventure travel for summer 2011,Today we will describe to you some of the most incredible experiences you can live in a YokmoK vacation. All Chamonix on the trip you can enjoy one of the most spectacular cable cars in the world. We take the Aiguille du Midi and we planted directly to 3840 meters. The views are from another planet. This is the Tour of Mont Blanc is the most popular trek in Europe and is considered one of the most beautiful and spectacular circuits in the world. 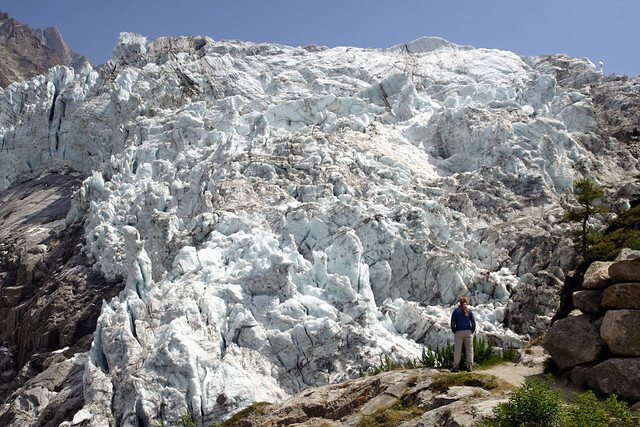 A trek through 10 mountain passes, and admiring 40 glaciers that descend from the heights. Tour de Rouges in the French Alps, we look at some of the most fabulous alpine scenery. One of the most amazing experiences is spending the night in a shelter at 2350 meters, on the shores of a lake of glacial origin. Prepare the cameras, because the sunset over the Mont Blanc massif is absolutely great. An intense week of climbing in the Chamonix valley learning techniques and high mountain glacier progression, which you can then use in other ascents. The goal is to reach the mythical summit of European mountaineering. Spectacular trekking in Swedish Lapland. Walk from shelter to shelter, hospital nestled in fascinating places and landscapes where we spend the evening enjoying the spectacle of nature that gives us the midnight sun. Hiking trip 200 kilometers above the Arctic Circle. Spectacular journey through the Norwegian fjords where we practice kayaking and hiking at a leisurely pace. Can you imagine a salmon fish and then cook it? A hiking trip in which climb the Jbel Toubkal, with its 4167 meters. It is the highest mountain in Morocco and North Africa. Discover Berber villages full of charm and friendly people. A journey of 229 kilometers of bike lanes, with many surprises and little difficulty, crossing the canton of Valais, the sunniest region in Switzerland. Travels over 100 km on the shores of Lake Leman, one of the largest lakes in Europe. Haute Route from Chamonix to Zermatt, the Mont Blanc to the Matterhorn. 180 km of a tour which is the largest collection of four thousand of the Alps and hills rise above 2900 meters. The ascent of Bishorn (4,153 m) in the Swiss Alps is the highlight of a week of mountaineering. An introductory course to rock climbing for people without previous experience in glacier and accompanied by professional guides.